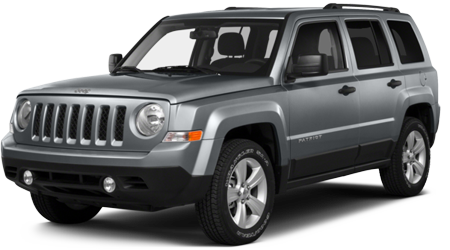 The 2016 Jeep Patriot is a big and strong crossover SUV with an "old school" feel in a "new school" body design and style. If you need a vehicle that can go off-road with ease, tackle any obstacle on the road, while remaining sleek and head-turning, the 2016 Patriot is the crossover to experience. At Lakeland Dodge, our dealership offers a wide variety of the best and most sought after vehicles on the road, and the 2016 Jeep Patriot is included in that conversation. If you are in the Wesley Chapel, Tampa, Brandon, Wauchula, Brooksville, Orlando, St.Cloud, Kissimmee, and Winter Haven areas and want a haggle free, customer-service oriented experience, visit us at Lakeland Dodge in Lakeland, FL to get a great deal on a great SUV. We look forward to serving you today. The Jeep Patriots provides a minimalist interior design that focuses on offering an easy to use dashboard and comfortable experience without complicating the driving experience. The cabin uses simple, yet sleek plastics, a straightforward dashboard layout and knobs with ergonomic controls while also remaining spacious with firm seats for both front and back passengers. Overall, the seating is comfortable, and the back cabin area provides a solid amount of cargo space, clocking in at 53.5 cubic feet of room. The 2016 Patriot also offers the Uconnect 8.4-inch infotainment system to help drivers incorporate smartphone technology, apps, Bluetooth® and hands-free capabilities. The Jeeps earns excellent marks for its simple cabin design, which always feels inviting and warm. However, the best way to experience everything the 2016 Patriot has to offer is with a test drive at Lakeland Dodge. The 2016 Patriot remains one of the most popular and affordable options in the Jeep lineup and with excellent powertrains, responsive handling and a sleek interior, buyers will quickly appreciate the SUV once they step foot into the cabin. If you are looking to own a Jeep, your search stops at Lakeland Dodge in Lakeland FL. Located at 2335 Highway 98 N, Lakeland , FL 33805, our dealership serves potential buyers from in and around the Wesley Chapel, Tampa, Brandon, Wauchula, Brooksville, Orlando, St.Cloud, Kissimmee, and Winter Haven, FL areas, with a team of knowledgeable and friendly Jeep experts.